Brisbane's most trusted debt collection and recovery agency. Marshall Freeman's expert team are trained and dedicated to getting your debt paid quickly. We provide both personal and commercial debt collection services in Brisbane, Gold Coast, Sunshine Coast, Toowoomba, Cairns and throughout Queensland. We maintain a strong focus on leveraging the best technologies and collection techniques that allows our experienced collection professionals to quickly identify a willingness and ability to pay. Then by applying the right amount of pressure, we are able to make your outstanding debt a priority. 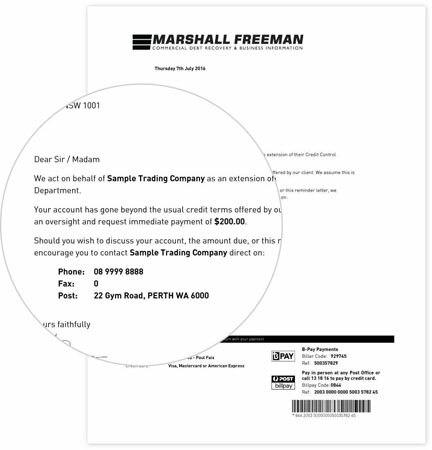 With a sole focus on getting results, this is why over 20,000 businesses in Brisbane and throughout Queensland trust Marshall Freeman with their debt collection. If you're looking for results driven debt collectors - look no further, as our local team know what it takes to get your debt paid and collect debts other companies generally write off.